I am mostly Slovenian. My great grandparents came to America on a boat full of other immigrants looking to make a better life for themselves. When my gram married and had my mom, she didn’t dilute the gene pool too much. Same thing with my mom when she married my dad. I am German, Dutch, Indian and Slovak – but the Slovak dominates. I blame that for my unnatural love of pierogis. And I’m a bit of a snob about them. I’ll eat non church pierogis, but there is one local church that makes them twice a year around Easter and Christmas and they are AMAZING. The best ever. My gram buys dozens of them and shares them with the rest of us. I freeze a bunch to have later, but immediately fry up a dozen with butter and some onions and eat half of them. Yep. No shame. Now, it’s summertime so that means my stockpile of church pierogis are pretty much depleted. <insert sad face here> So when I recently had a hankering for pierogis, the Inside Out was born. 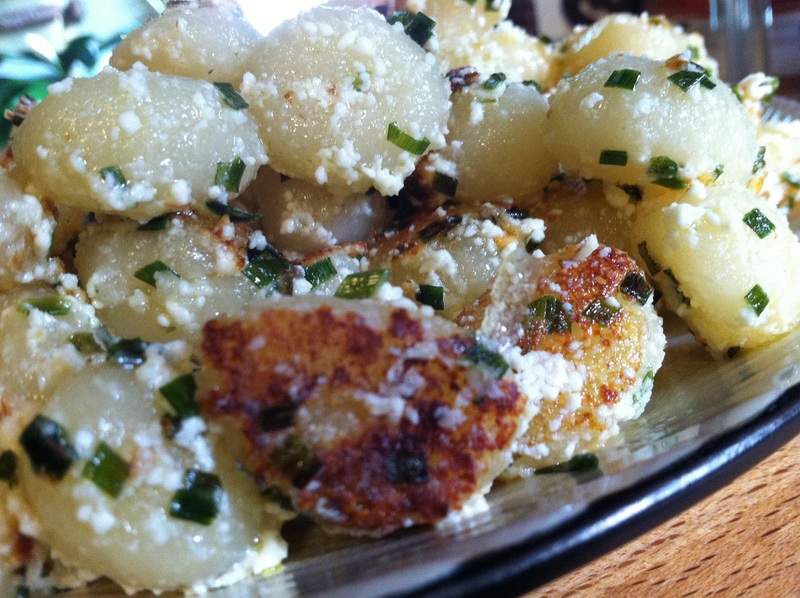 You’ve got the dough aspect covered by the gnocchi – and they are traditionally made with potatoes so there is the potato aspect. Add in the ricotta for cheese and the chives for the onion and voila! And amazingly, they do taste a whole lot like pierogis. I loved it! I will most certainly be making these again. And I actually ate this as lunch, not as a side. I accompanied it with a salad and it was a delicious and filling meal. Cook the gnocchi according to package directions. Drain and set aside. Using the same pot the gnocchi were boiled in, add your oil and butter and heat over medium heat until butter is melted and the olive oil is hot. Add the cooked gnocchi to the pan and toss to coat. Let the gnocchi cook for a few minutes so that they get crispy and brown on one side. While they are browning, add the ricotta, chives and garlic salt. Stir to combine and cook until ricotta cheese it hot. Anyway, Sunday was a whole chicken for dinner kind of day. We were working out in the yard. And when you are working out in the yard, you don’t really have the time (or energy) to put into peeling, chopping, boiling, mashing potatoes. That is too much time, and too many steps. 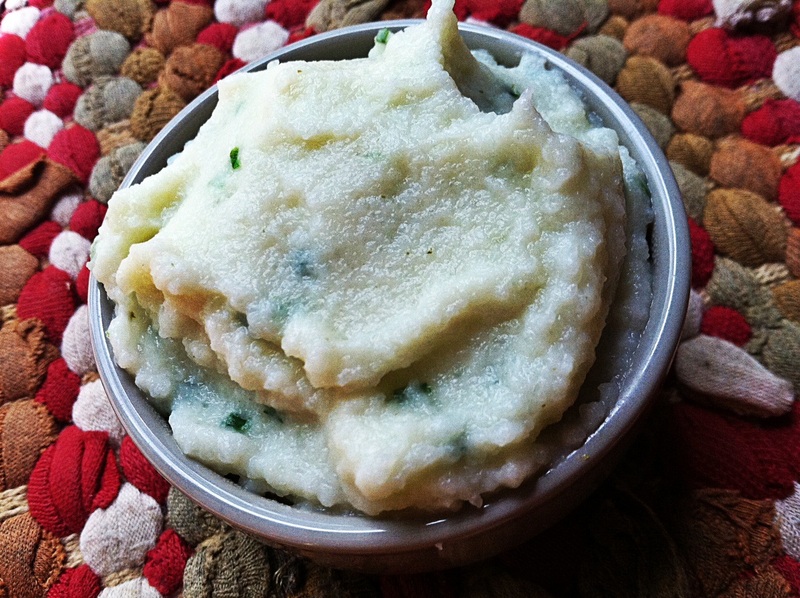 Enter in the Garlic Cauliflower Mash. This was AMAZING. Seriously. I could have devoured the whole bowl of this stuff, but decided I should probably eat some chicken, because it’s pretty amazing. When these are done being blended, they look just like mashed potatoes. Hubs even liked them. He said you could tell it wasn’t actual potatoes because they were not dense like mashed potatoes, but good, with lots of flavor. Fluffy, tasty, and one could be tricked into thinking they were potatoes whenever they are topped with gravy. I will be making these many more times to come over the summer because these came together quickly. As in, like 15 minutes start to finish quick. They taste great the next day too. I almost didn’t share the leftovers with the hubs. Almost. If you don’t have boursin cheese, you can sub in cream cheese. Just add in some extra chives, and a bit more garlic powder for the extra flavor. Don’t have an immersion blender? You can put the recipe into a food processor or blender, whatever you have on had. I would say that a potato masher will work too, but you won’t get the smooth texture that you get from blending them up. Don’t like cauliflower? Well then why in the hell are you reading this recipe??? Wash and chop your head of cauliflower into chunks. Add to boiling water and cook for until fork tender, 6-10 minutes depending on the size of your chunks. Drain well. While still hot, pat dry with paper towels, pressing down to squeeze out any excess moisture. Add to a bowl with the boursin, garlic powder, salt & pepper, chives and butter if using. Add in the hot cauliflower, and using an immersion blender, mix until smooth. Serve immediately. Hello my sarcastic followers! I’m not sure why, but I’ve been on a cabbage kick recently. Maybe it’s because of my Slovak background and I’m getting hungry for halushki. Maybe it’s because it’s cold out and since the chickens have limited access to greens, we always have a few heads of cabbage around so they can have a treat. Maybe it’s because I just spent a week in Las Vegas and ate and drank so much not so good for me stuff that I need a bodily reset back to healthy eating habits!!! Who knows. But I was wanting to come up with a way to eat cabbage that was healthier than good old-fashioned butter laden halushki, and tastier than steamed or no butter added sautéed cabbage. 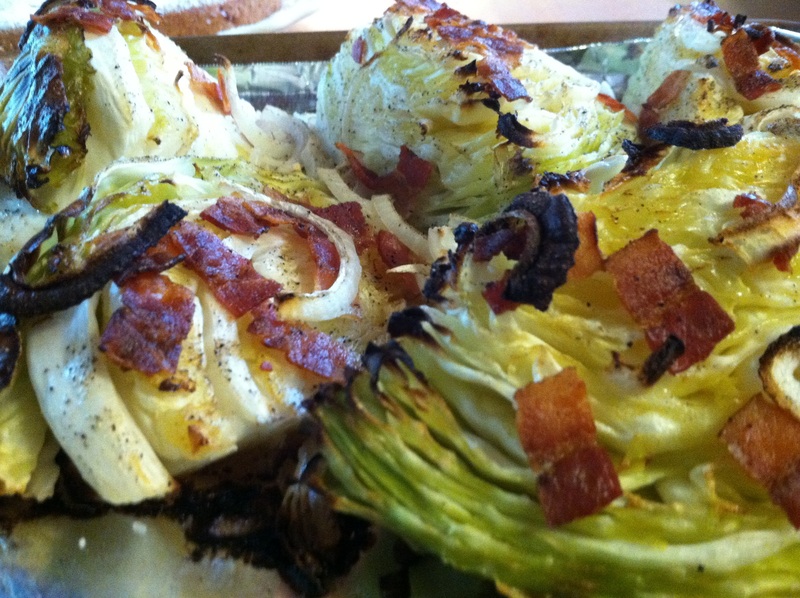 And the roasted cabbage wedge was born! 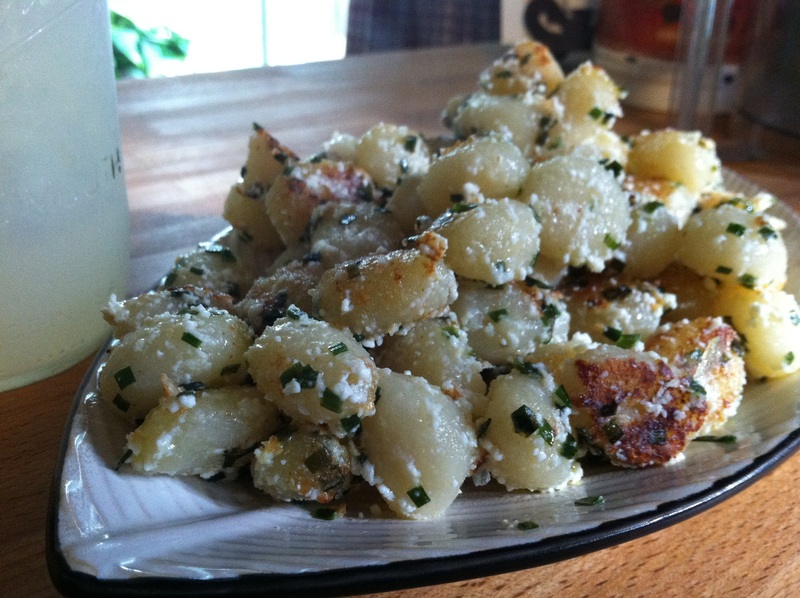 It’s a very easy side dish to make. It’s relatively healthy (2 tablespoons of butter divided by 6 servings!). And even the leftovers are great. We ate this alongside a marinated pork tenderloin that cooked in the oven on the same baking sheet as the cabbage. Dinner was ready to eat in under an hour, including prep work and cook time. 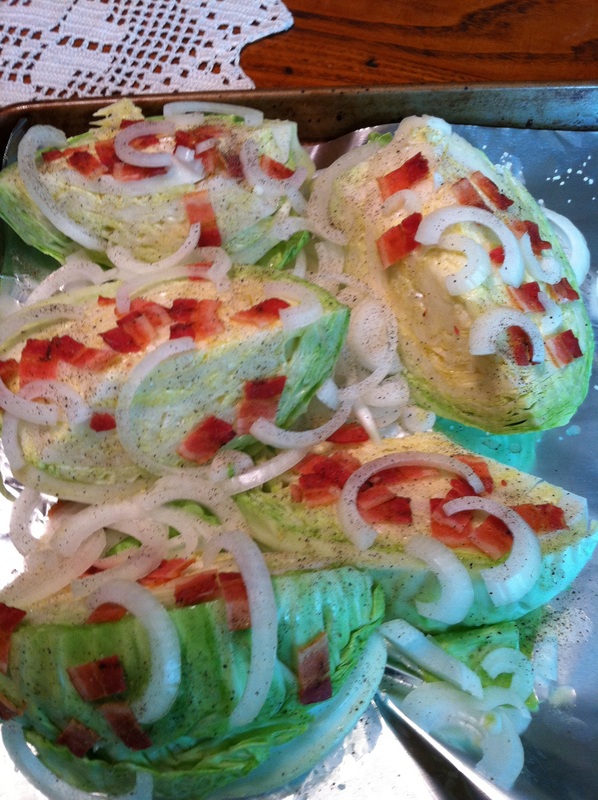 I would actually be perfectly content to eat these cabbage wedges on some egg noodles and have that as a meal. A lower fat sub for halushki! Preheat your oven to 400 degrees. Cut cabbage into single serving wedges, coring out the hard stem section. You should have about 6 wedges. Place them on a foil lined rimmed baking sheet. In a microwave safe bowl, melt your butter. To that bowl, add the olive oil and stir to combine. Using a pastry brush, brush each wedge of cabbage, focusing on the top parts since the butter/oil mixture will pool underneath the cabbage wedges. 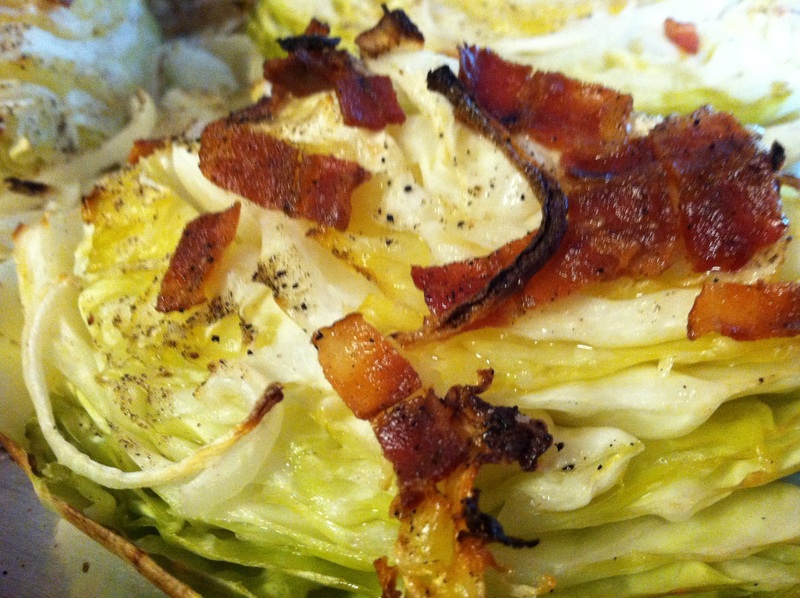 Distribute chopped bacon and onion moons over each cabbage wedge, then sprinkle with kosher salt and pepper. Place in preheated oven and let cook for 35-40 minutes, until cabbage is cooked and getting nice and roasted. Onions will be brown/charred. Serve and enjoy! Too much of anything for me ends with me getting sick of said thing. With certain exceptions: bread, eggs, and salad. We have salad with every meal. On those rare occasions when I am out of salad stuff, it feels like there is this huge void because there is no salad. Dinner is a downer, no matter how wonderful when salad is missing. Ok, not REALLY a downer, but still. A critical piece of the meal is missing. With the summer days having been so very hot and the hubs on a mission to lose weight, he had started requesting just a big salad for dinner. Well, sweet. I can lose weight too AND save oodles of time on dinner prep by tossing together a salad! Woo hoo!!! So, one day I found myself with some beefy romaine lettuce heads. Hmmm…seeing as how this is not my most favorite type of lettuce, I decided to help make it more palatable to me, I’d get wild and grill it. Grilling salad is no new thing, but I think we tend to forget about this option when prepping our meals. We put everything else on the grill, why not our salad too? Now, the thought of eating a grilled iceberg lettuce or grilled field green salad sounds rather gross to me. But romaine is nice and sturdy. It can handle the heat. That char that some of the leafy tops get just adds a lovely depth of flavor. Now, since this is a grilled salad, meaning it will be warm when served, I wanted any additional ingredients to also be grilled and warm. So I grilled up the green onions. I even cut a couple of tomatoes in half and grilled them too. And the bread, oh the bread. Grilled to perfection with a lovely hint of garlic. I could eat a whole baguette of this stuff by myself. As it stands, I ate 1/4 of a baguette and forced myself from going back. This recipe can easily be double, tripled, quadrupled to serve multiple dinner guests. The recipe below is enough to serve 2 as a side salad, or 1 as a dinner salad. I have already asked hubs to keep a path cleared to the grill when it starts to snow because this has rather quickly become my new favorite salad. I use my Creamy Italian Dressing with it, but you can use whatever you like. I wouldn’t go for any soft cheeses though as they will get melted and stuck together from the warmth of the salad. Harder cheeses are key. As is simplicity, which is why there are so few ingredients. Sometimes it’s nice to have a dinner that you don’t have to think too hard about or do tons of prep work. Enjoy! Preheat your grill so the grill plates are nice and hot. 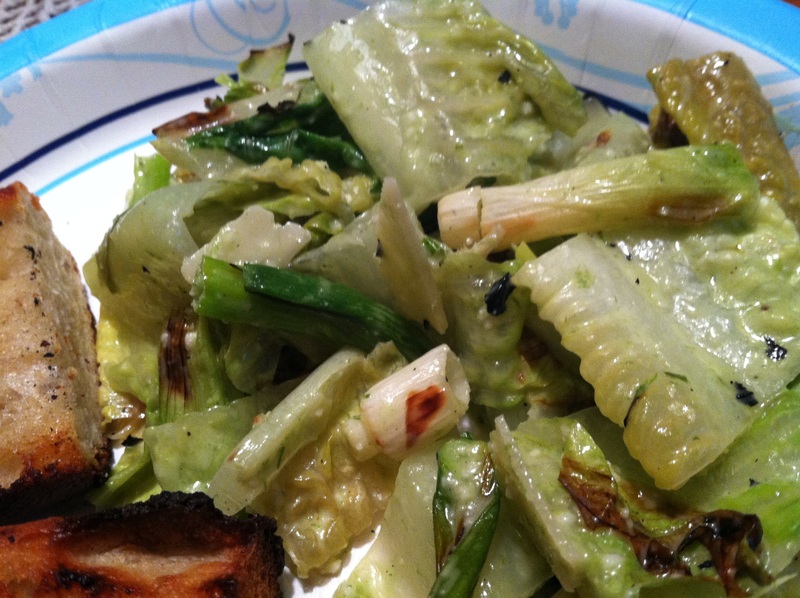 While the grill is heating up, drizzle olive oil over your green onions and romaine lettuce halves. Sprinkle with kosher salt. Take the garlic clove halves and rub them all over both pieces of the baguette, tops and bottoms. Smear a little butter on the tops of each baguette half and sprinkle with some kosher salt. 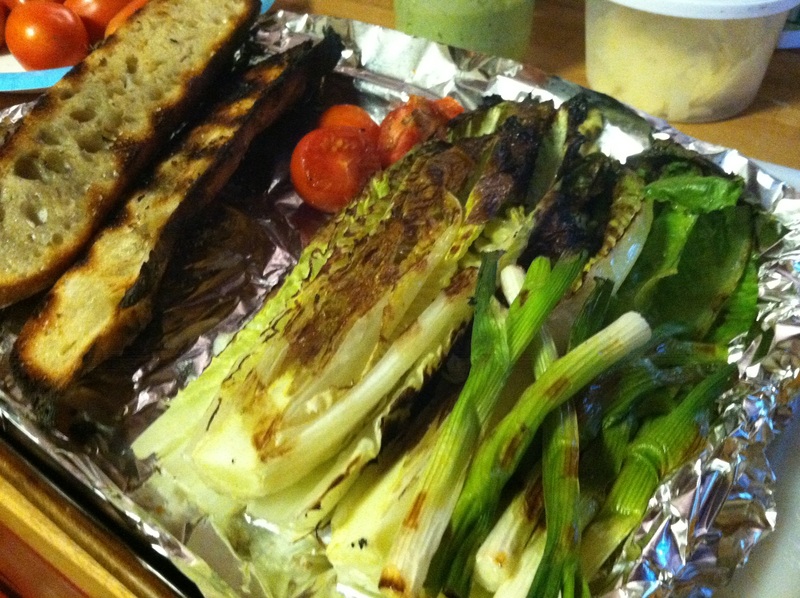 Place your lettuce and bread halves cut side down on the hot grill along with your green onions. 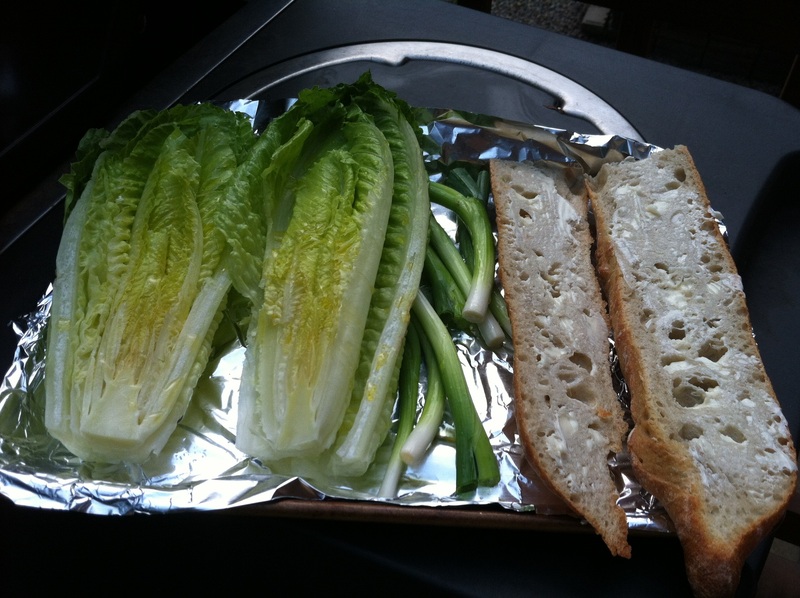 Let cook about 5 minutes or until the lettuce starts to get nice and browned and flip both the lettuce and the bread. Check your onions, once grill marks appear and onions start to get soft, flip them. Cook for about 5 more minutes. Remove everything from the grill. Transfer the lettuce and green onions to a cutting board, and using a sharp knife, roughly chop everything into bite size pieces. 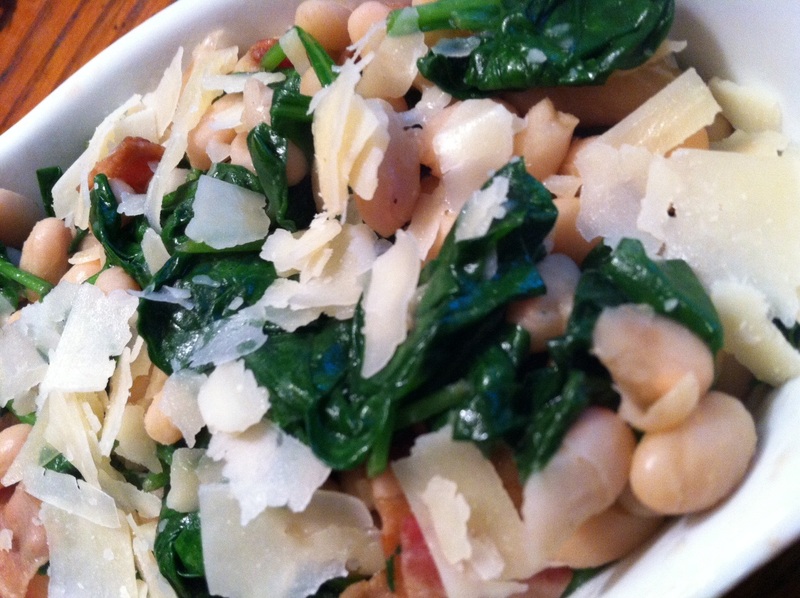 Place in a bowl, sprinkling top of salad with shaved parmesan. Add dressing and toss to coat. Serve with the grilled baguette and enjoy! I love dumplings – and these ones are fantastically simple and delicious. 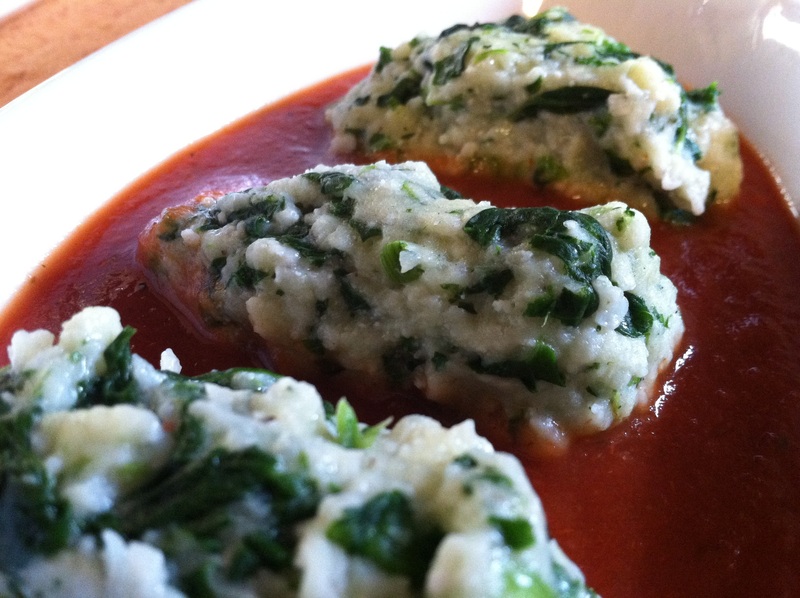 Spinach, ricotta, parmesan – wow. They are quick and easy to make. You can make them on a weeknight. Yes, homemade pasta for a weeknight dinner. So many people feel that from scratch cooking has to be fussy and time-consuming. It really doesn’t. This meal from start to finish was at 30 minutes or less. While the dumplings were boiling, I was pan frying some strips of thin steak that I seasoned with nothing more than roasted garlic seasoning and some A-1. Hubs LOVED this meal. Thought it was amazing. Simple ingredients + minimal time in the kitchen means I get to have extra time to relax and enjoy the hubsters company. It’s lovely. Bring a large pot of salted water to a boil. Add all of your ingredients but the flour to a medium bowl. Using a fork or your hands, stir to combine everything together. Add the flour. Stir until just combined. Using a small cookie scoop or 2 spoons, shape the dumplings into ovals and place on a plate or cookie sheet. Heat your pasta sauce until piping hot. Drop dumplings 1 at a time into the salted boiling water. Cook for 3-4 minutes, or until dumplings float to the top. Using a slotted spoon or skimmer, gently remove the dumplings from the water. 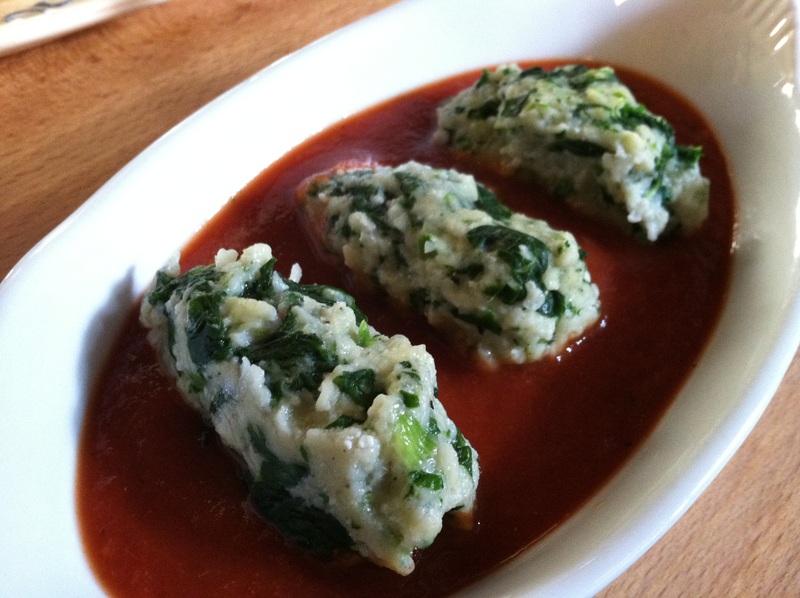 Place a layer of sauce on a plate or in a bowl and top with dumplings. Serve as a main dish with some crusty bread and a salad or as a side with some pan seared steak or chicken and salad. In the fight to eat healthier and more nutritious foods, asparagus is a super hero and should be sporting a cape. It’s packed full of nutrients, helps break down carcinogens and free radicals, it’s full of antioxidants, and can also help fight our brains cognitive decline. See? Totally a super food. It’s great raw in salads, sautéed in noodles with chicken, grilled up for a side dish. 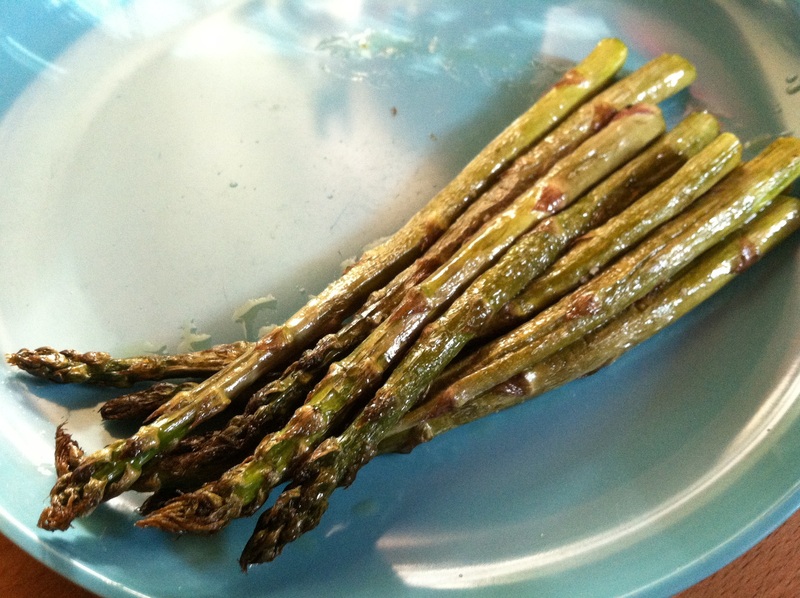 But roasted asparagus is one of my all time favorite ways to eat this super veggie. It’s such a simple process with little prep work and additional flavor additions, letting the true flavor of the asparagus shine. So simple in fact, that I feel ridiculous for posting it. Not ridiculous enough though. Some of us are so busy in our daily lives that we think eating healthier has to be complicated, time-consuming, and expensive. It really doesn’t have to be any of those things. While roasting this, you can be grilling up some chicken breasts and making a salad to go along with it all. 30 minutes tops to a healthy dinner option. 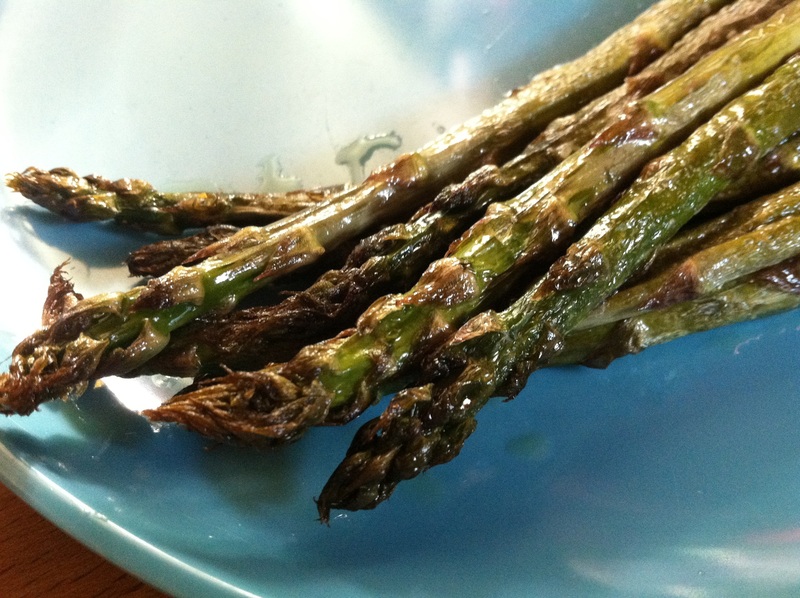 When choosing asparagus, go for bright green stalks and not too dry tops. If the tops are too dry then the asparagus spears are most likely starting to get rubbery from sitting around too long. If you buy it fresh from say, a farmers market and don’t plan on eating it right away, trim the ends off when you get home and stick it in a shallow glass of water. That will keep the asparagus fresh longer. Preheat your oven to 420 degrees. 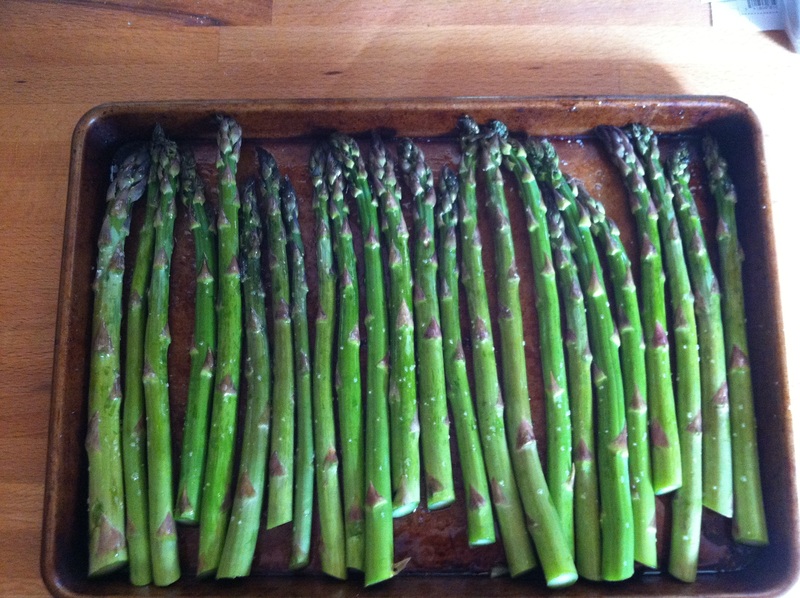 Take a rimmed baking sheet and arrange your asparagus in a single layer. Drizzle olive oil over the tops and sprinkle with kosher salt. Using your hands, rolls the spears around to coat in olive oil and salt. Place spears in oven and roast for 20 minutes. Season with more salt & pepper to taste. Serve alongside your normal dinner, or add to a salad. Got leftovers? Chop them up and put them in a omlet!